Found her on the 1870 Catskill, Greene, New York census (img 39) as Sarah A. Bates age 32, keeping house. Found her on the 1880 Catskill, Greene, New York census (dist 71 img 27) as Sarah A. Bates age 42, Keeping House. Prior to her marrying Cleminson, she was married to Harvey Geiger. Found her on the 1860 Caernarvon, Berks, Pennsylvania census (img 10) as Tamson Ammon age 10. Found her on the 1880 West Nantmeal, Chester, Pennsylvania census (dist 99 img 9) as Tamson Finger age 25. Father, mother born Pennsylvania. Found her on the 1920 Robison, Berks, Pennsylvania census (dist 133 img 19) as Tamson S. Geiger age 65. Found her on the 1900 Gallatin, Columbia, New York census (dist 12 img 14) age 61. Found her on the 1860 (not stated), Catawba, North Carolina census (img 161) as Sarah A. Bost age 2. Found her on the 1930 Warroad, Roseau, Minnesota census (dist 46 img 8) as Helen Finger age 44. Father, mother born Scotland. All of her children listed on the 1930 census were born in Canada, so they must have lived there from at least 1912 to 1922. Found him on the 1920 Jacobs Fork, Catawba, North Carolina census (dist 40 img 32) age 4 years 4 months. Found him on the 1930 Jacobs Fork, Catawba, North Carolina census (dist 19 img 34) as James A. Crooks age 14, living with his mother's parents, Thomas and Florence Finger. Found him on the 1880 Precinct 1, Shackelford, Texas census (dist 178 img 3) age 2. Found him on the 1900 New Albany, Floyd, Indiana census (dist 74 img 12) age 3. Found him on the 1910 New Albany Ward 7, Floyd, Indiana census (dist 82 img 5) age 13. Found him on the 1920 New Albany Ward 6, Floyd, Indiana census (dist 79 img 29) as Karl Finger age 22, bookkeeper, single, living at home. Found her on the 1900 Cherokee, Spartanburg,South Carolina census (dist 84 img 46) as Carrie E. Finger age 5. Found her on the 1910 Cherokee, Spartanburg, South Carolina census (dist 76 img 4) as Carrie Finger age 15. Found her on the 1920 Cherokee, Spartanburg, South Carolina census (dist 86 img 29) as Carrie Lee Finger, age 25, widow. She is living with her widowed mother and siblings. Found him on the 1892 Brooklyn Ward 1, Kings, New York state census (E.D. 26 img 5) as Christian Finger age 11. Found him on the 1900 Brooklyn Ward 28, Kings, New York census (dist 527 img 7) age 19, bookkeeper, grocery. His WWI draft registration card shows his occupation as Statistician, American Tel. + Tel. Found him on the 1910 Brooklyn Ward 28, Kings, New York census (dist 911 img 14) age 29, clerk, telephone co.
Found him on the 1880 District 15, Knox, Tennessee census (dist 158 img 6) as Jonithan B. Finger age 6. Found him on the 1900 Civil District 15, Knox, Tennessee census (dist 87 img 22) as Johnathan B. Finger age 24, single, living at home. Farm laborer. Found him on the 1910 Civil District 3, Knox, Tennessee census (dist 108 img 23) as Jonathan B. Finger age 35, single, living at home. Store keeper, grocery. Found him on the 1920 Civil District 17, Knox, Tennessee census (dist 143 img 4) as J. Boyd Finger age 45, salesman, store. No children. He is living next to his brother John. Found him on the 1860 Benton, Yates, New York census (img 55) as Samuel J. Finger age 4. Found him on the 1870 Benton, Yates, New York census (img 9) as Samuel J. Finger age 14. Found him on the 1920 Oconto, Oconto, Wisconsin census (dist 169 img 15) as William Finger age 13. He is living in the houshold of his step-father Anton Chezek. Found him on the 1940 Oconto, Oconto, Wisconsin census (dist 42-21 img 24) as William Finger age 33. Truck driver, milk retail. Found him on the 1850 Benton, Yates, New York census (img 79) as William O. Finger age 3. Found him on the 1860 Eldred, McKean, Pennsylvania census (img 14) as Wm O. Finger age 13. Found him on the 1870 Portville, Cattaraugus, New York census (img 6), age 23, born New York, farm laborer. He is living next to his father James Finger. Found him on the 1880 Benton, Yates, New York census (dist 215 img 4) age 37, born New York. Works on farm. Found him on the 1992 Milo, Yates, New York state census (E.D. 02 img 6) as William A. Finger age 45, laborer. Found him on the 1900 Penn Yan, Yates, New York census (dist 142 img 23) as William O. Finger age 52. Found him on the 1910 Penn Yan, Yates, New York census (dist 179 img 5) age 62. Found him on the 1920 Penn Yan, Yates, New York census (dist 182 img 23) as William O. Finger age 73, widower. He is living with his son Melvin and his family. Found her on the 1880 Kingston, Ulster, New York census (dist 134 img 9) as Kate Finger age 31. 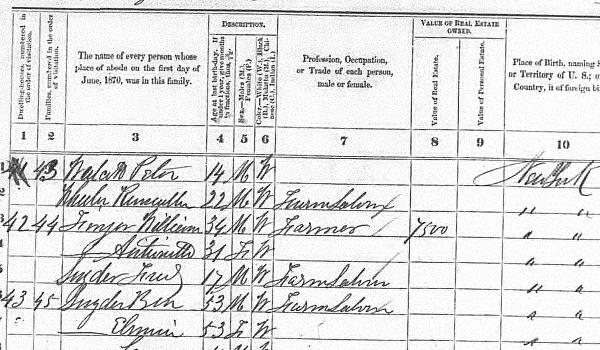 Found him on the 1880 New Haven, New Haven, Connecticut census (img 39) as Henry Landolt age 29, Pattern Maker. Father, mother born Switzerland. Address, 145 Washington St.
Found him on the 1900 Brooklyn Ward 22, Kings, New York census (dist 357 img 23) as Henry J. Landolt age 49. Supt, Brass & Iron. His wife Emma is listed as a widow on the censuses in 1920 and 1930. Found her on the 1920 Cheltenham, Montgomery, Pennsylvania census (dist 74 img 14) as Aldyth Longshore age 8. Found her on the 1930 Cheltenham, Montgomery, Pennsylvania census (dist 24 img 12) as Aldyth Longshore age 18. Found him on the 1910 Elberta, Woods, Oklahoma census (dist 269 img 1) as Sydney Lowry age 7. Found him on the 1920 Monterey Park, Los Angeles, California census (dist 13 img 25) as Sydeny L. Lowry age 16. Truck driver. He is single, living in the household of his brother Herman Lowrey along with his siblings Ruth, Louise, and Gwendolyn. Found him on the 1940 Lloyd, Ulster, New York census (dist 56-47 img 15) as Kenneth Mayen age 3. Found her on the 1930 St. Louis, St. Louis, Missouri census (dist 354 img 28) as Helen McGraw age 19. A burial record from St Lawrence Cemetery, West Haven, New Haven, Connecticut shows buried next to James F. Hull is Mary J. Hull McDowall. The burial date is 28 June 1986. Perhaps she remarried. Found her on the 1850 Clermont, Columbia, New York census (img 10) as Margaret E. Stall age 17. Father: Arthur James VISEL Sr.